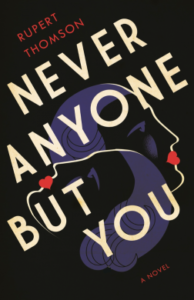 Never Anyone But You by Rupert Thompson is an in-depth historical fiction following the surrealist photographers Claude Cahun and Marcel Moore through their first meeting in the early 1900s, their move to 1920s Paris, followed by their survival during Nazi occupation, and ending with their final years on the small isle of Jersey. Thompson’s choice to tell this lifelong love story from Marcel’s point-of-view gives an intimate look into the world of living amongst larger-than-life historical figures in a time when homosexuality was at best, ignored, and at worst, persecuted. Marcel is the perfect narrator; an artist in her own right, a painter and photographer, she is also the stable, steady sail in the tumultuous world of Claude’s life. Through their relationship, they run into famous artists, writers, and revolutionaries who shaped today’s world, risking themselves socially and politically during one of the most horrific times in modern history. Thompson puts his readers right in the middle of this explosive political climate, creating a profound juxtaposition in the characters’ avant-garde behaviors while the reader knows the storm that’s coming, even if the characters have only guessed at it. The most intriguing part of this novel was spending intimate time amidst hundreds of historical art figures that fall in and out of the couple’s lives. Dali makes an appearance, along with a host of surrealists and famous silent film actors. The names and meetings soar by, only to resurface tangentially later on as a letter in the post or a meetup after the war, creating a deep emotional payoff in the last chapters. While in the moment, readers may wonder why so many characters seem to be crowding the pages only to drop out of the story; these quick run-ins and fast snapshots were incredibly realistic to how Marcel and Claude would have interacted with these acquaintances at the time. The Post War art scene was filled with a detached interest in anything and everything. Marcel and Claude host parties where their apartment is bursting with people they may or may not actually know. They run in strange circles with beat poets, naked dancers, inflammatory writers, and revolutionaries. Their relationship is the only constant in a quickly changing world, but at the same time, they can only truly be themselves in the society of these tangential acquaintances. As with many LGBTQ stories, Marcel and Claude are not well known to history, though much of their art survived the Nazi invasion. Thompson’s intimate and heartbreaking view into a love that withstood half a century through revolutions, war, and fascism is a story incredibly relevant and important for today. Their story lives on through this novel, giving readers a glimpse into two women’s journey to overcome a world that would not accept them and, as Thompson shows, they succeeded. Abagail Belcastro has a Masters in Fiction with Fairleigh Dickinson University. She is a reader for TLR and a teaching assistant with FDU’s Creative Writing department. Her essay, “A Time for Fantasy” is published with Fiction Southeast.